Over the last several centuries, as science helped us gain more knowledge and a better understanding the world, it has also made inroads in fields that were traditionally viewed as “religious.” So as science developed, religion changed, as well. First, religion stopped being the source of ultimate truth for most people. If you asked, “Where did we come from?”, for most people living in most of Western history, the stories in Genesis would have provided the basis for that truth — the world was created in six days, with humans being the apex of creation. But eventually, Galileo, Copernicus and Darwin provided more accurate answers, meaning that the Bible could no longer be relied upon for factual, scientific information. Next, religion stopped being the source of morality for most people. If you asked, “How should we act?”, for most people living in most of Western history, the Bible would have been the basis of their ethics. But eventually, Enlightenment thinking, universalistic ethics and a historical analysis of religiously-fueled atrocities like the Crusades and the Inquisition showed that religion and morality were not necessarily always linked. So today, since a large percentage of the population feels that religion is not a source of ultimate truth or morality, those of us in the religious world need to ask what the purpose of religion should be. For me, as someone who values pluralism, autonomy, and critical thinking, I believe that religion needs to become primarily a source for personal spiritual fulfillment, a place to find community, and a way to make a positive impact on societal and global issues. And what’s most inspiring and most surprising about this outlook is that while conversations about truth and morality often pit science and religion in opposition to each other, when we talk about meaning and values, science and religion can come together in productive ways. From gratitude to compassion to morality to decision-making to memory, science has been providing us with new ways to think about these issues — and so now, religious leaders can integrate the latest findings when they teach and preach. For example, if we want to talk about war and peace, we can use the data in Steven Pinker’s book The Better Angels of Our Nature to explore what would lead to Isaiah’s vision of people “beating their swords into plowshares.” If we want to talk about what it means to be “sacred,” we can look at Jonathan Haidt’s new book The Righteous Mind. David DeSteno has done research on compassion, Martin Seligman has written about human flourishing, and Dan Ariely has examined how we make decisions — and all of the scientific knowledge gleaned from their research can be brought together with religious teachings to strengthen ourselves and our world. If the purpose of religion is to advance a narrow vision of truth, or to dictate how we should act, then religion will close itself off from science and reason, since they are clearly threats to that worldview. But if the purpose of religion is to elevate ourselves, to strengthen our social bonds, and to improve our world, then I believe that science can be an enormously valuable partner in that endeavor. 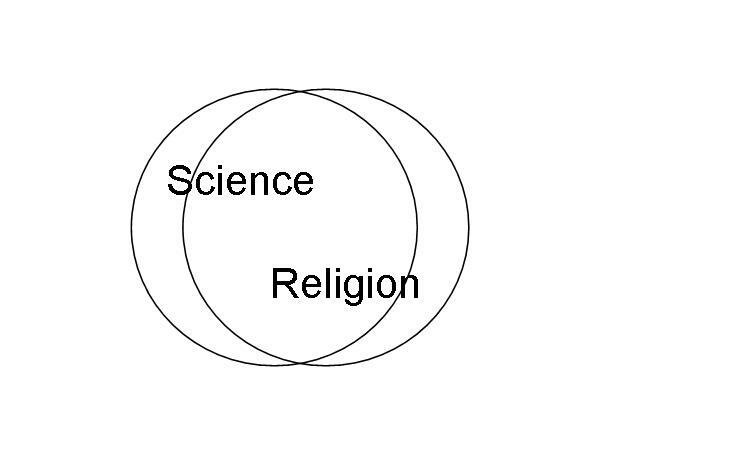 How Should We Talk About Science and Religion? As someone who loves both religion and science, I often struggle with how they interact. Are they in opposition to each other? Do they need to be reconciled? What happens when new scientific knowledge challenges the tenets of my faith? Part of the difficulty in talking about science and religion is that there are several different ways we can discuss their interaction. Dr. Jennifer Wiseman, the Director of the Dialogue on Science, Ethics and Religion at the American Association for the Advancement of Science, outlined several different models in an outstanding talk. Therefore, inspired by her, I want to share four different ways we can frame the discussion about how we talk about science and religion. But there are two problems with this paradigm. First, religion has theories about what the universe is made of — for example, Jewish tradition has statements about the way the world came into being and why the world is the way it is. And science is now talking about morality and even meaning, with books like Sam Harris’ The Moral Landscape about the science of morality and The Brain and the Meaning of Life by Paul Thagard about neuroscience and meaning. Thus the magesteria, in fact, do overlap. 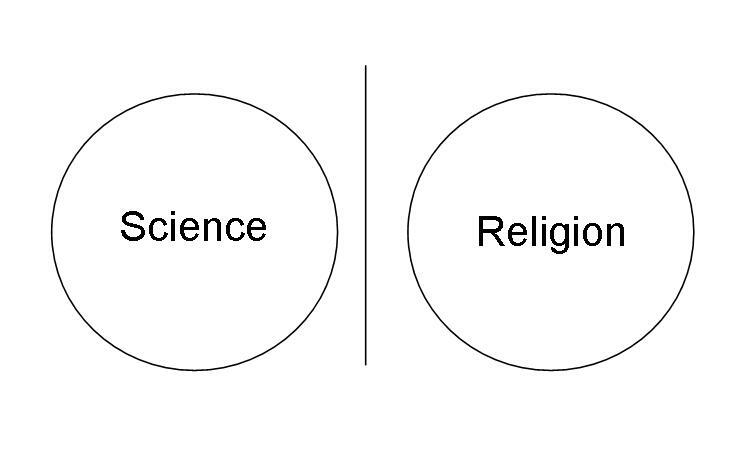 So for people who view themselves as both scientific and religious, the Contrast model often makes them comfortable. But as science enters into the realm that has historically been the purview of religion, and especially if we look more deeply at religion and at science, this model stops working very well. The Concert model is the opposite of the Contrast model, as people try to directly reconcile science and religion. It is another attractive outlook to those who are both dedicated to their faith and committed to reason, since it means they would not have to reject either. This model makes claims such as the concept of a “day” in Genesis may actually be billions of years, or that the crossing of the Red Sea was actually finding a swamp that could be crossed at low tide. But here, too, there are problems with this view. After all, science is always changing, discovering new data and revising theories. If science and religion are in concert, what happens to religious faith when new scientific evidence arises? Indeed, not only physics and biology but also human sciences such as archaeology, political science and history are helping us understand who we are, why we do what we do, and our place in the universe. So if religious faith is based on science, what happens when science presents new evidence? Indeed, this model makes it hard to do a critical analysis of Biblical texts, and that type of study frequently leads to a crisis of faith. In order for it to work, this model requires significant mental gymnastics, and forces people to maintain only a surface understanding of both science and religion. So while this view may be appealing at first, it is actually quite fragile. All that needs to happen is for science to discover something that contradicts a deeply-held belief, and people will easily elect either atheism or fundamentalism. The Conflict model is the paradigm that gets the most press, and it claims that religion and science are inherently incompatible. It’s the idea that if you buy into one, you must reject the other. This worldview is exemplified by Richard Dawkins and Christopher Hitchens on one side, and people who deny evolution because it contradicts the Bible on the other. But while this outlook generates the most passion from people on the extremes, there are a vast number of people who do not buy into it. …interviewed 275 tenured and tenure-track faculty members from 21 research universities in the United States. Only 15 percent of respondents said religion and science were always in conflict, while 15 percent said the two were never in conflict. The majority, 70 percent, said religion and science are only sometimes in conflict. Thus while zealous advocates on each side often dominate the discussion, there is a large silent majority who do not see science and religion as inherently in conflict. The bigger problem is that while the Conflict model produces a lot of heat, it rarely creates light. It regularly devolves into unproductive arguments and ad hominem attacks, and causes both scientists and religious people to become either overly aggressive or feel themselves to be “victims” of the other side. So even though for some people, this is an outlook they hold strongly to, it is much more likely to shut down conversations than to open them. This is the outlook that I find most resonant. 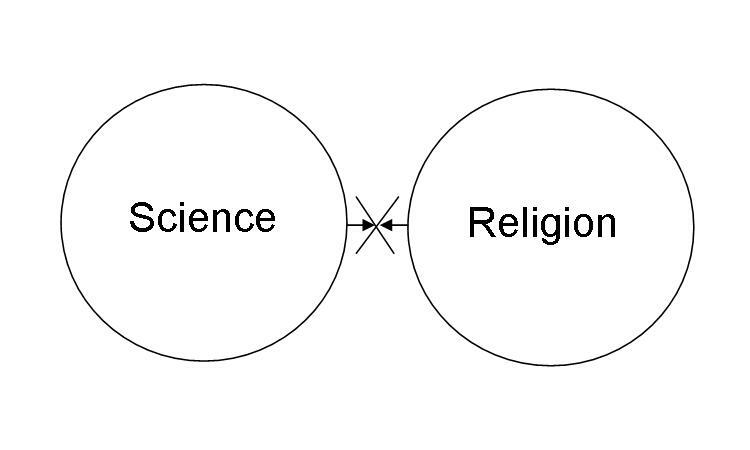 In this model, science and religion can remain in their own spheres, but when it is appropriate, they can also mutually inform each other, and provide us with a variety of ways to help us know what it means to be human. Indeed, its great value is that it reminds us that both religion and science have to be understood in the context of human experiences, because both religion and science are human endeavors. The Contact model reminds us that science is not independent of the scientists who pursue their field of inquiry. After all, while the universe may be 13.7 billion years old, and humans may have evolved on the African savannah, it has only been since modern times that human beings have sought to undertake a rigorous understanding of fields like cosmology, paleontology, psychology, neuroscience and biochemistry. We have to remember that not only does scientific knowledge provide information, it is deeply influenced by the passions, the curiosity and the personal experiences of the scientists who pursue it. 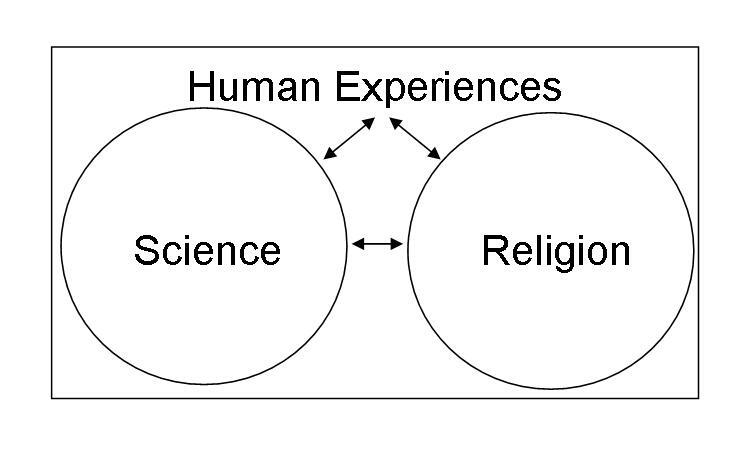 When we place science and religion in the context of human experiences, we recognize that both science and religion are driven by human needs and are victim to human foibles. The Contact model thus encourages humility in both science and religion, reminding both sides that there are things we do not know, and things we will never know. So for those of us who feel connected to God, when we forget that religion is not Divine, but human, we can easily fall into the trap of arrogance and narrow-mindedness. Micah thus reminds us that justice, mercy and humbleness are truly the most important values. Indeed, our ultimate purpose in life is to strengthen ourselves, both as individuals and as a society. Science does that by giving us a fuller understanding of the world, by advancing knowledge, and by examining the relationship between theory and evidence. Religion does that by giving us a sense of purpose, by strengthening communities, and by giving us a potential glimpse of the Divine. When we remember that both science and religion are human enterprises, we can remember that the most important question isn’t whether they need to be viewed separately, or if they can be reconciled, or if they are inherently in conflict. The most important question is: how are they being used? Helping 13-year-olds understand a 3,000-year-old text is challenging, to say the least. After all, trying to glean lessons from the Torah for 21st-century America is hard enough, even if you have some background in text study. So when you have only 13 years of life experience, go to religious school for only two hours twice per week, and are still learning the skills you need to write and speak effectively, it’s even harder. Yet as our kids become b’nei mitzvah and create their d’var torah — the teaching they deliver about the weekly Torah portion on that Shabbat morning — we often miss a great opportunity. Not only can we help them understand the content of that particular Torah portion, we can also help them appreciate the process by which we can engage with serious Torah study. At Temple Beth El, we wanted to help our students truly embrace the process of Torah study. So to prepare our b’nei mitzvah, we decided to experiment with the “Question Formulation Technique” (QFT), designed by Dan Rothstein and Luz Santana and outlined in their outstanding book Make Just One Change. The purpose of the QFT is to shift how learning occurs: rather than having students respond to questions proposed by the teacher, the students themselves develop the questions that most effectively direct their own learning. After all, if the students are the ones posing the questions, then they will naturally develop a deeper level of ownership over their own learning. • Ask as many questions as you can. • Do not stop to discuss, judge, or answer the questions. • Write down every question exactly as it is stated. • Change any statement into a question. After creating their long list of questions, the learners then focus on the handful that speak to them the most — and so that’s the direction where the research, the discussion or the conversation goes. And so since the learners create their questions, and the learners then choose the ones that excite them the most, the paradigm shifts radically: instead of the teacher imparting information from the top down, the students are creating their learning from the bottom up. In Judaism, questioning has always been a sacred activity. Throughout Jewish history, when we study Torah, we are asking questions like, “What might this verse mean? How can we read it in a new way? What other allusions does it have?” So applying the QFT was a natural way to help our b’nei mitzvah develop their divrei torah. As part of our family education program, eight families came together about four months before their children become b’nei mitzvah. And we began by having them write a collective d’var torah, in order to help them understand the process. We focused on a passage from Deuteronomy 8: “You may say to yourself, ‘My power and the strength of my hands have produced this wealth for me.’ But remember Adonai your God, for it is God who gives you the ability to produce wealth…” (v. 17-18). I then wrote up four words on the board: “Gratitude for material things.” And then I told them to write down as many questions as they could about that idea, that they weren’t allowed to answer or discuss the questions, to write down every question exactly as it was stated, and to change any statement into a question. And then I simply walked around eavesdropping on the conversations. The energy was palpable, as everyone was considering what it really meant to “show gratitude for material things.” After a short discussion, we decided to go in depth about how gratitude acts as a check on entitlement — an issue that is as relevant today as it was 3,000 years ago. We studied commentary, explored interpretations and shared our own opinions. And most crucially, the students now had a process to apply to the study of Torah, discovering ways to find meaning from the text. So now, it was time to have them use this process on their own Torah portion. They began by focusing on their specific verses that they would be reading, and came up with an eight-word description of the verses’ gist — “the special clothes Aaron wore,” “the detailed instructions for building the tabernacle,” “the laws of keeping kosher.” As two to three families joined together as a small group, each student’s summary acted as a prompt for creating a list of questions. After hearing and creating many, many possible questions, the bar or bat mitzvah student then chose the one question they would be most excited to research. We then placed copies of Torah commentaries (The Torah: A Modern Commentary and The Torah: A Women’s Commentary) for all the families and said, “Take a look — see if you can find responses to your questions. What have other scholars had to say about what you’re wondering about?” For the next thirty minutes, families were poring over texts, excitedly yelling, “Oh! I found something!”, and began crafting their own thoughts. They proudly shared with me their ideas, and were so excited about what they themselves had created. It was simply remarkable. Afterwards, the parents and the students shared how much they loved learning as a family, how much they enjoyed researching commentary on the Torah portion, and how smart and successful they felt as they drew lessons from the Torah. Not only did the quality of the divrei torah improve dramatically, but the students had clearly gained a new set of skills they could apply to study a whole range of texts, and perhaps most importantly, truly owned their learning process. Too often, preparing students to become bar or bat mitzvah feels like “studying for the test.” And as anyone who has ever “studied for the test” knows, the day after the test, all the information goes in one ear and out the other. Instead, becoming bar or bat mitzvah should truly be about making a transition — namely, from being a child in the Jewish community to becoming an adult. And so as our 13-year-olds grow and develop, and as we celebrate their entrance into the Jewish community, we have an opportunity and a responsibility to teach them skills for life-long learning. What are those skills? To be able to connect the present to the past and to the future. To be able to add their voice to a Jewish conversation that is 3,000 years old. And most of all, to be able to formulate good questions, since after all, what we learn is simply defined by the questions we ask. So let’s help our students learn how to ask good ones. Quite often, what makes us happy and what is actually good for us are directly at odds with each other. What worked for us evolutionarily over the millenia frequently becomes counter-productive in our current world. For example, fat was a scarce and valuable resource when Homo sapiens evolved on the African savannah, but with vending machines, Starbucks Trentas and the KFC Double-Down, what made our bodies happy millions of years ago are now things we should be trying to avoid today. But if those same issues arise with our bodies, what about our brains? What do we do with our evolutionary cognitive history? David DiSalvo, who writes about science, technology and culture for Scientific American, Forbes and Psychology Today, has a new book coming out entitled What Makes Your Brain Happy and Why You Should Do the Opposite. I had the opportunity to interview Mr. DiSalvo, exploring questions about the cognitive aspects of religion and atheism, hope and faith, certainty and doubt, and the creation of meaning. 1. You recently wrote a piece asking, “Religion vs. Atheism: Which Fights Dirtier?” If we wanted to tone down the anger on both sides, what would help facilitate a more productive discussion? DD: I think the major thing would be for all of us to realize that we’re operating with essentially the same cerebral hardware, with all the foibles and biases contained therein. We often begin difficult discussions about belief (religious or otherwise) as if we are somehow set apart from the biases that plague the other person. In truth, we are all swimming in murky water, and there is nothing flawless or absolute about the iterative process of learning to navigate the waters with more clarity. So he’s right on — we all need to realize that we are not set apart from the biases others have. Accepting that none of us has absolute truth and that we all see the world through our own imperfect lens is what allows us to engage in fruitful dialogue, rather than vituperative attacks and counter-attacks. 2. You say in the introduction to your book, “If we could live our lives without bias, distortions and delusions involved, the world would truly be idyllic.” Yet hope and optimism — which certainly bias and distort the way we view the world — are crucial aspects for our drive to make ourselves and our world better. So when do we need to look at the world as it is, and when do we need to envision the world as it could be? How do we reconcile those two ways we look at the world? DD: The “bias, distortions and delusions” I discuss in the book are outcomes of mismatches between several of our brains’ evolved tendencies and our social and cultural environments. My contention is that cultural evolution moves much faster than natural evolution; as a result, the built-in leanings of our brains are frequently as odds with the situations we face on a daily basis. Hope and optimism are “biases” of a different sort – arguably, they are adaptive responses to the constant undercurrent of adversity we face as self-reflective, sentient beings living on this planet. Recently a solid body of research has emerged suggesting that optimism is actually an evolved trait (cognitive neuroscientist Tali Sharot’s work comes to mind). Another way to describe the difference is by way of comparison. Would we be better off without, for example, restraint bias, which leads us to believe we can expose ourselves to more temptation than we can actually handle? Probably so. Would we be better off without the transformative power of hope that drives us to overcome obstacles and adversity in our lives? Certainly not. GM Response: Actually, Tali Sharot’s book The Optimism Bias was one of the inspirations for this question. And I love the image on the cover of her book — a pair of glasses, with one lens clear and the other rose-colored. And I think we need to look at the world through both of those lenses. The scientific lens can help us see the world as it is, since it strives to give us objectivity. The religious lens can help us see the world as it could be, since it strives to help us examine the subjective nature of our experiences. It’s important to remember that hope and optimism are primarily subjective experiences — they cannot change reality, but they can change how we look at reality. They change how we feel about our lives, and they give us fuel to keep going when life becomes difficult. And in fact, I think that’s what draws people to religion — a desire to find a sense of purpose, meaning and hope, all in the context of a supportive community. So as DiSalvo implies, even if hope and optimism aren’t rational, they are valuable. So yes, when it comes to objective truth, science needs to be the way we look at the world. But religion can help us enhance our subjective experiences, as it allows us to make moments powerful, to create deep connections with others, and to find hope and purpose. 3. You mention that one of the problematic things our brain does is to create meaning out of coincidence. But there’s a difference between believing that meaning is inherent (such as thinking that “clearly this was God’s plan”) and believing that we create meaning (such as asking, “How can I make sense of what’s going on?”). So do the same problems arise in creating meaning as they do when we believe meaning is inherent? What would it imply if “meaning” arose in different ways? DD: Your question highlights one of the more frustrating aspects of being human. It is precisely because our brains evolved to “makes sense of what’s going on” that we stumble on pattern-based biases like the clustering illusion, and are prone to stringing together coincidences in search of an explanatory pattern. In a sense, we can’t escape this tendency no matter how aware of it we become, because pattern identification is so central to our brains’ reason for being. What we can do, however, is short-circuit pattern detection on the verge of, or already going, haywire – as is the case, for example, with people who live their lives around certain sequences of numbers appearing as signs telling them how to think and act in given situations. Psychics and other hucksters exploit these sorts of tendencies, in effect making a living on peoples’ absorption in patterns. Frequently, believing meaning is inherent goes hand-in-hand with searching out patterns to make sense of what’s going on. Once, for example, someone invests confidence in a psychic to tell him what the patterns in his life mean, it’s a short journey to believing that someone or something must be producing the patterns. Whether that thing is thought to be a personal God, or some impersonal force (“the universe” etc.) depends largely on the socio-cultural context that person lives within. So, yes, I do think some of the same problems occur whether we are searching out or “creating” meaning as they do in believing meaning is inherent, because the underlying “meaning infrastructure” of our brains is prone to tendencies that we are all, in one way or another, subject to. GM Response: I think we agree on what “meaning” is — it’s about how we place events and facts into a larger context, helping us make sense of the world. But for me, the most crucial question about meaning is how it arises — is it top-down, dictated and discovered, or is it bottom-up, self-owned and created? Since we all have a “meaning infrastructure,” who do we see as its builders? So the problem with psychics, hucksters and religious fundamentalists is that they try to prevent the reader from creating their own interpretations. They encourage a top-down approach to meaning, and lead people to say, “This is what God / the universe / the Bible means.” But a bottom-up approach of creating meaning may be able to prevent that system from going haywire, since we can later edit or revise our interpretations. We will always be looking for patterns and meaning — but I think there’s a big difference between thinking we “discover” meaning and realizing that we “create” meaning, since one implies an eternal, unchanging truth, and the other implies an ability to re-write as need be. 4. Why is doubt so valuable? And since our minds seek certainty, how can we embrace doubt more easily? DD: Doubt is an applied “checks and balances” mechanism that is not unique to humans. My speculation is that it’s an adaptive trait that began evolving very early (well before human ancestors arrived on the scene) as a means to differentiate beneficial from harmful things in the environment, particularly when the differences were slight. We see this trait evidenced by primates and monkeys in lab studies: when offered grapes under two different conditions, one slightly more cumbersome than the other, a capuchin monkey will quite observably make a doubtful evaluation about the grapes with more strings attached. In humans, the only true existential animal on the planet, doubt is elevated to far more abstract levels of evaluation (“is there a God?” and similarly high-level questions), but is also useful at lower levels such as determining if another person’s intentions are sincere. In that practical application, among others, doubt can save our lives. The interesting thing is that to exercise doubt about meaning-laden positions (those involving belief and value judgments), we have to face off against other tendencies of our brains like the desire for stability and certainty. That’s what makes those high-level evaluations so spirited, tense, and frequently explosive. If someone is “certain” that their belief position is correct, someone else introducing doubt about that position is likely to set off fireworks. But it’s important that we have those discussions because peoples’ lives are directly affected by the outcomes. GM Response: That face-off between doubt and certainty is absolutely one of the biggest challenges we face when we are engaging in conversation about beliefs and values. The challenge is how we embrace stability without it lapsing into absolutism. One of my teachers, Rabbi Brad Hirschfield, talks about the need to be able to be committed without being certain. The analogy that I like is to a marriage. You are never certain when you get married what the future will bring, and if you are always looking for surety, you will never be satisfied. But at some point, even though you will never be certain, you make a decision to commit to this other person, because that’s how you will build a life and a relationship. It’s similar to how we need to look at our worldview. In order for us to make an impact on the world, we need to stake our claim somewhere — we need to hold certain beliefs and values, because if we always we go, “I’m not sure, it could be this way, or it could be that way,” we become paralyzed and cannot make decisions. Because while certainty shuts down conversation and fosters a sense of arrogance, doubt can open up the dialogue and encourage humility. DiSalvo argues that many of the things that make our brains happy are now more harmful than helpful. And some people place religion in that category, as well. Religion is like fatty foods, they claim — something we should outgrow and move beyond. But I think the better question is, what aspects of religion should we try to outgrow? Because religion is not one thing. Religion has so many varied parts to it that rather than throwing the baby out with the bathwater, we can try to move beyond the elements that are so counter-productive, and at the same time, try to keep the ones that are valuable. Clearly, when religion fosters absolutism, certainty and a lack of critical thinking, it is doing more harm than good. But we need hope and purpose in our life when it seems dark and difficult. We need to find ways to strengthen our commitments when we feel adrift. And we need a sense of community when we feel isolated and alone. Those are the things we can and should never outgrow — and so those are the things religion can and should offer us for today.